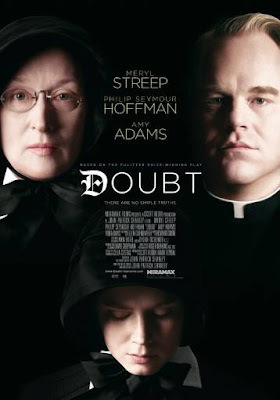 In this Oscar-nominated adaptation of John Patrick Shanley's Tony-winning play, Sister Aloysius (Meryl Streep) begins to have doubts about doting priest Father Flynn (Philip Seymour Hoffman), who seems to have become overly involved in the life of a young African American pupil. But Flynn isn't the only one she doubts. Is she overreacting to the situation, or is there truth behind her convictions? I'm afraid I am writing this review weeks after having seen the movie. So much of it has faded into the shadows of my memory. So forgive me for not going into it more deeply. A priest befriends a black student, the only one in the school. Is the priest's attention an effort to ease the boy's transition into a somewhat hostile environment or is there something more there? Sister Aloysius believes there is. Her suspicions only grow the more she observes and learns about Father Flynn. Why did he leave his last perish? Why was he holding the boy's shirt and returning it to the boy's locker? And what about the other boy in the school, the one who flinches and acts out whenever Father Flynn is around? Amy Adams' character, a young nun, is plagued by her own doubts. On the one hand, Sister Aloysius' makes a convincing argument. But then, so does Father Flynn. Is he being singled out by an overly paranoid nun? Meryl Streep, Amy Adams and Philip Seymour Hoffman give amazing performances--emotional and thoughtful. Even so, I do wish the movie had gone a little farther, delved a little deeper. The movie itself is thought provoking, leaving in its wake many questions. I never doubted that Sister Aloysius believed Father Flynn was molesting the boy. And yet it was hard to believe that Father Flynn had done anything wrong. He was equally as convincing. The boy himself did not disclose any abuse. In actuality, Father Flynn was a much more likable character than his accuser, and I found myself wanting to believe his side over hers. And yet. There was always that doubt. Could I ever really be sure? There was that other boy to consider, the one no one really addressed . . . And sometimes the most charming and genuine-seeming people are the most dangerous. The evidence the sister was collecting against him, however, was really rather flimsy--and could have been completely innocent. The title of the movie is quite fitting as not only are the characters full of doubt, of each other and even themselves, but it leaves the viewer just as much in doubt. At least it did this movie viewer. I actually really loved this movie. I loved the ambiguous ending and all. I thought this was a fantastic movie because of the fact that the viewer just does not know. My husband and I debated this movie for a few days after finishing it. Ultimately, it comes down to your view of what is presented and how you interpret them as well as your view of humanity. Do you always think the worst of people? The best? And in this situation, is it better to assume the worst for the safety of the children? Such food for thought - to me that is a sign of an excellent movie. The director and cast did a terrific job in making the audience think, sympathize, and never find the answer. I love the actors you mentioned, so I bet I would like the movie. I'm wondering why I don't remember hearing anything about it. This looks like a great film, one that I've had on my "I want to watch" list forever! Great review! Thanks for the review Wendy! I wasn't going to watch this movie because I had preconceived notions about it but you've just cleared that up for me and now I'm quite eager to watch it. I thought Meryl Streep was incredible in this. I can't believe I still haven't seen this one. I love Meryl Streep and Phillip Seymour Hoffman and I know that in and of itself will insure I enjoy the film. It seems I am years behind with my movie watching! I have been really excited about this movie after watching a few previews. It also doesn't hurt that Hoffman is a brilliant actor! I am definitely going to put this movie on my list and try to watch it soon. Thanks for the great review, it sounds as though you really enjoyed it. This is a movie I've been waiting to rent until my husband isn't at home. It looks like it's right up my alley but, definitely, not his. Thanks for your excellent review! Have a good reading week! I want to see this movie. It sounds good. I want to watch this one for sure. I forgot about it until you reviewed it!!! Thanks! I like movies with Meryl Streep in them. Very nice! I have to admit I've avoided this one because I know the ending is ambiguous - I think it would drive me crazy! Word Lily - It was a great movie. I wish I hadn't waited so long to see it. Michelle - Very well said! And so true. My husband didn't have any interest in seeing this one so I watched it on my own. I think we would have been talking about this one quite a while had we seen it together. It really does make one think. Jenclair - I loved the gossip sermon too! It was so good--and spot on. I didn't mention the mother's reaction above, but that made quite an impression on me too. Kathy - It got quite a bit of publicity for a short while but I don't think it was in the theaters for very long. I imagine it would be easy to miss if you hadn't known to look for it. Miss Remmers - I hope you get to see it soon. It's definitely worth seeing. Nicola - I gave way too much away in my review, I know realize. LOL Talk about spoilers. Anyway, I think you might like this one. Charley - She was incredible. I love her in just about everything she does. She's so talented. Kathleen - I now the feeling! There are quite a few movies I've been wanting to see but haven't--many older ones. Zibilee - He is! Hoffman is a brilliant actor, I agree. Definitely try to catch this one. It's worth seeing. Linda - My husband didn't care to see this one either. I do hope you get a chance to see it. I hope you have a good reading week too! Yvonne - I hope you will like it when you do see it. Alice - I enjoy movies with Meryl Streep too. I hope you get to see this one! Carrie - I can see why an ambiguous ending would drive you crazy. It might have me had I not been prepared for it. Julia & Stacy - I ended up skipping this one in the theater because I wasn't sure about it. I'm so glad I decided to watch it once it was out on DVD. I have yet to see this but definitely need to soon! Lisa - I hope you enjoy it when you are able to see it!